Infinite Art Tournament: At the Movies: "Following"
I sometimes wonder why we like star actors. I mean, like everyone else I refer to a star’s reputation as a gauge of what to expect from a movie – “it’s got George Clooney in it, it’s probably pretty good” or “it has the late Robin Williams in it, I’m out of here.” And there is a fun meta-game that goes on as we recognize familiar faces and try to pick out where we’ve seen them before. Plus, I guess there’s simple interest in celebrity, if you’re into that. But in opposition to all that, it has always seemed to me that if I recognize an actor, and I am thinking about that actor, then I am not seeing the character and experiencing the movie, and therefore the film has failed in an important way. Wouldn’t movies be better, I often think, without star actors? And, according to similar lines of idealistic yet grumpy reasoning, wouldn’t movies be better without all of the technology, all of the gloss, all of the special effects, all of the money, basically, that gets thrown at the standard commercial product? Well, obviously it’s not that simple. If we had a film industry that spent much less money per film to make many more films, we would mostly get heaps of self-contained 90-minute soap operas. But Following is the kind of ultra-low-budget film that shows what a handful of clever, talented people working with a bare minimum of time and equipment can do. And what they can do is put together an intriguing, stylish, intelligent film with a personality all its own. Plot: A young man without much to fill his days begins following people around the city as a sort of hobby. This lands him into trouble, but it’s a long time before we finally figure out exactly what kind of trouble he has landed in. Director Christopher Nolan would go on to make Memento and Inception – movies that are quite good, despite their high budgets and high-profile acting talent – and here in Following we see him developing his usual tricks. The narrative is decidedly non-linear, with effect often proceeding cause. For a while, it’s not clear exactly how many characters we are seeing. This keeps us just a little confused, and therefore curious, and therefore engaged. It also connects us with the characters on the screen, who are often as confused as we are. Information is cleverly rationed so that, when it is finally revealed, we feel the satisfaction of the pieces falling into place and flatter ourselves that we are damned clever to be able to hang with this storyteller. It’s good fun. 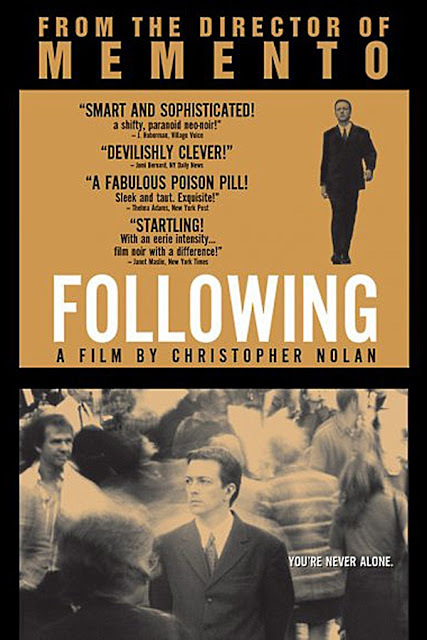 In his later films, Nolan has often put in some big twists toward the end that force you to reassess your understanding of everything that has gone before. Did he do that all the way back in Following? Well, I wouldn’t want to give anything away. Visuals: Shot in grainy black and white and without lighting, Following looks great. It helps that its story places it comfortably in the tradition of film noir, but there was clearly a lot of talent, creativity, and patience involved in filming and editing the film. Acting: The three key performers were amateur stage actors. If there were any shortcomings in their film acting, it was certainly not enough to knock me out of my suspension of disbelief. I was particularly impressed with the performance of Alex Haw as Cobb, a character who is part Raskolnikov, maybe, and part Mephistopheles. He captures his character’s arrogance but also his charisma, and has terrific screen presence. But after working on Following on weekends during graduate school, Haw launched a successful career in architecture. He owns a few restaurants now, and enjoys writing. He has never acted in another film. That’s my kind of movie star! Prognosis: Highly recommended for fans of Hitchcock or classic noir. Highly recommended for people who like Quentin Tarantino but wish he wasn’t so enamored of bad old genre films. Highly recommended for people who liked Memento. I liked it a lot.